Christmas time is the perfect time of year to be more playful with your look. Party season demands creative, festive and glamorous make-up looks and is the ideal time of year to be a bit more experimental. Every year impressive make-up creations hit the press, blogs and social media sites, and many of us draw inspiration from others creative Christmas style. A great way to instantly inject a touch of festivity into your look is with glitter. Most versatile to use on the eyes, chunky glitter in winter shades is a great way to look glam with out too much fuss. Top tip: To make glitter more intense wet your eye shadow brush before dipping into the glitter and patting onto the lids. As a rule of thumb, I’d say glitter sits best on the top lid, but over Christmas feel free to go OTT on glitter and line your bottom lid with it too. 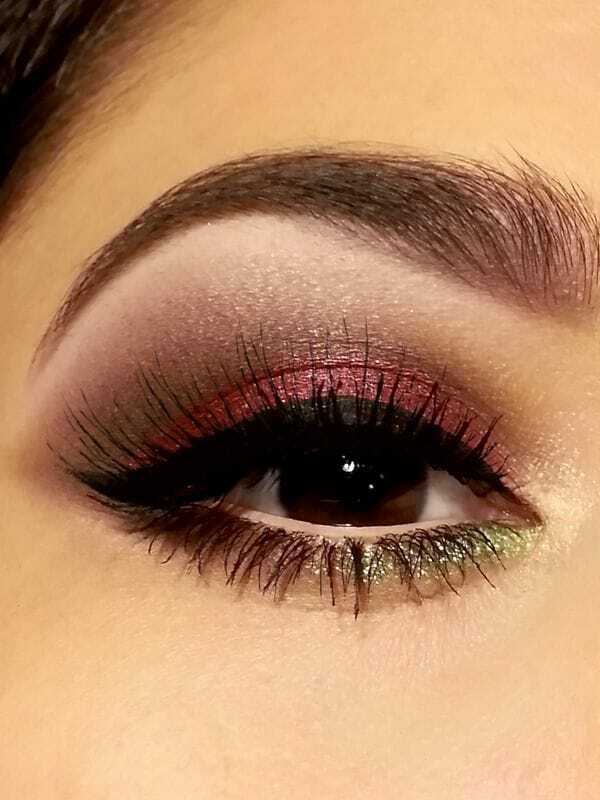 I love this contrasting look, using a bold colour on top and a more subtle glitter on the bottom, all topped off with false lashes for a dramatic look. Top tip: Use an angled brush under the lid to apply glitter close to the lash line. Typically it’s best to either go for a dramatic eye look, or lip, but not usually both. Most make-up rules can be abandoned during this time of year and for the most part anything goes. A gorgeous festive look is to go for a winged eye in a dark grey or charcoal (one with a little shimmer or glitter is great), and a berry lip. Top tip: Because you are going for a strong eye and lip look, instead of choosing black for the eye and a deep plum for the lips, instead choose charcoal for the eyes and a lighter plum or soft magenta on the lips for a wearable look. Make an impact with your smile by going for a bold glitter lip look. Perfect teamed with a subtle eye look or even natural looking false lashes, a glitter lip is a great alternative to glitter shadows and is one of those looks that near enough only works at Christmas. You can play around with almost all colours of glitter, but reds and berry shades work best. Top tip: Apply a lipstick of a similar shade to your glitter as a base, then pat on glitter using a firm brush. If you’re not quite ready to go full on with glitter try a glitter gloss instead. Glitter, lashes, liner and shimmer are all great make-up products to easily achieve an impressive festive make-up look, I especially love glitter across the top lids with classic black winged liner. Share this with your friends and family who you know love festive looks and don’t forget to share your tips and tricks too!